Susan C. Patterson researches, writes, and edits three national monthly newsletters: IOMA's Report on Training and Development, IOMA's Report on Training Programs, and HR Department Management Report. The Institute of Management and Administration (IOMA) publishes a broad range of high-quality products for business professionals. Each of the products serves two purposes: to improve the efficiency of subscribers and to enhance the financial performance of the firm or organization. List of Tables, Exhibits, and Figures. What's Your Budget for That? How to Build a Business Case for e-Learning. How to Develop a Training RFP. A Quick, Consultative Approach to Needs Assessment. What If the Problem Isn't You? Taking the "Pulse" of Your Training Programs. How to Use Research to Avoid "Snake Oil" Training. Chapter 3. Selling Your Training. Seven-Step Process for Selling Your Training Programs. Getting Management Off the Bench. Three Steps to Take Training from the Periphery to Business Partner. Chapter 4. The True Costs of Training. Glen Head's Thirteen Steps to Analyzing Student Training Costs. The Five Most Effective Training Cost-Control Strategies. Chapter 5. Training Return on Investment. True ROI: Going Beyond Smile Sheets. Comparing the ROI of Classroom Versus Online Training. Measuring the "Soft" Results of Training. Measuring the ROI of Management Training. Three Criteria That Will Tell You When e-Learning Will Work. Five Things to Consider Before You Consider e-Learning. How to Get Support from Your IT Department. How to Assess the Cost of e-Learning. Use the Distance Learners' Bill of Rights to Make Learners "Stick". Tips to Ensure e-Learning Transfer. What's an LMS, and Do You Need One? Case Studies of Successful e-Learning Initiatives. The Five Principles of Successful Human Performance Technology. Gloria Gery's "TurboTax" Model for Performance Improvement. Best Practices in Performance Improvement. Chapter 8. Expanding Your Reach. Should You Join a Training Consortium? What If You Train People Before You Hire Them? How to Do Your Training on Someone Else's Dollar. Chapter 9. Training That Means Business. New-Hire Orientation-Your First Shot at Training. Training as a Recruitment Tool. Training's Role in Employee Development. Training's Role in Preventing Employment Litigation. Diversity Training as a Competitive Strategy. How to Evaluate Online Safety Training. Measuring the Effectiveness of Violence Prevention Training. How to Avoid Discrimination in Training. Chapter 10. 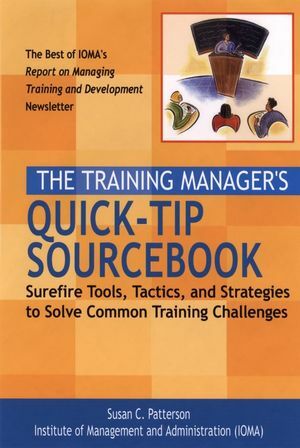 Five Strategies for Running a Small Training Department (Carol P. McCoy). Establish Credibility and Build Support for Training. Determine Priority Training Needs and Focus Training on High-Impact Areas. Determine the Best Resource Strategy and Manage Resources Wisely. Develop the Right Skills to Manage a Small Training Department.